Our youngest grandson decided he wasn't going to miss out on the family Christmas and arrived five weeks early on the 6th of December. He is our second son's fourth son; sadly his third son was arrived 20 weeks early and was born sleeping in May 2011. This little one was conceived about a year later and the pregnancy was monitored very carefully. We were overjoyed to get him so close to full term but were worried for a little while as he was not doing as well as we had hoped and was kept in the special care nursery under the watchful eye of the wonderful nursing staff until he was able to hold his own in the world. His special care meant he didn't get to meet his two older brothers until he was four days old. The boys had been to see their Mum over the previous four days and had rushed into the room and straight to her, unaware that their tiny brother was also there. This photo was taken by their Dad a few minutes later. We allowed the family time to get to know one another before meeting him for the first time. He was home with the family for Christmas and continues to grow with all the love and care we can provide. Susan, beautiful page,love it,thanks for joining in at BITW!! Oh my goodness, this is a priceless photo, such loving looks from his big brothers. The layout is lovely Susan, love the layers of patterned paper. Oh such a touching story and what a beautiful photo of the older brothers gazing so lovingly at their little brother... I love all the layers and the papers look wonderful.. and thanks for joining in at BITW too!! 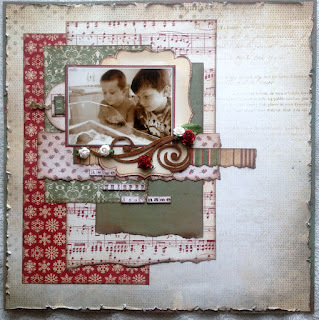 Susan this is a gorgeous layout, I love the paper colours you chose and the layout design. You write beautifully and I was touched by the story. Congratulations on the new addition to the family and I'm glad he is doing well now.